This is a beautiful memoir that reads like a novel. 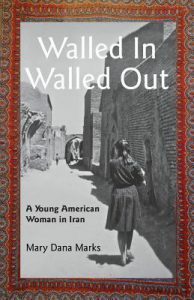 It begins with the idealistic Mary being sent by the Peace Corps to help people in an Iranian city, where she is immediately made to feel it is she who is lacking in civilization and, in fact, is told that she needs to learn to be “human.” Mary finds herself faced with social restrictions that go against her independent and adventurous spirit. She is put up in a compound that walls her out from most interactions with the city and yet puts her on display for the young women inside, who watch her every move. Mary is a normal girl in her early twenties who enjoys associating with young men her age, and we cheer as she insists on being “human” in this sense of the word. She is honest with us about her frustrations as she navigates this alien culture and its restrictions while still managing to develop relationships with young men. Her story makes it clear that serving in the Peace Corps in Iran was a very different experience for a woman than it was for a man. The male Peace Corps volunteers in Kerman have much more freedom to act like Americans. Mary has been trained to teach English using a very effective method, but she is “placed,” as her Peace Corp field officer terms it, in a situation where she is not allowed to teach. Instead she is required to sit in the front of various classes listening to an Iranian teacher instruct the students in Farsi. Her field officer doesn’t want to hear about the absurdity of her “placement.” Mary is undaunted, however, and she and her Peace Corps colleague Betsy start after-school English clubs at four girls’ high schools. Slight in build, her dress was a riot of bright colors draping over loose pants intricately embroidered at the ankles, orange plastic sandals flapping on her brown feet. But it was the shiny, bronze-toned mask that stopped me short. Obscured from hairline to lip, her face resembled a prehistoric reptile. This woman would have drawn attention even in Kerman. And yet, Mary realizes that to the Iranians she lives among, she is the one who seems exotic. An underlying theme of her story is that her stay in Iran benefitted her more than it did Iranians. Each time Mary returns to Kerman from a trip, she feels more like she is returning home. Their culture seems less foreign. There is a particularly striking example of this. When she first comes to Kerman, she meets a young woman who had an arranged marriage. The custom seems unimaginably alien to her. But near the end of her stay in Kerman, a group of women offers to arrange a marriage for her to an Iranian doctor. Here is her initial reaction: “Marry me? Someone wants to marry me? Really?” This probably isn’t much different from an Iranian girl’s first reaction. Could it be that she’d become even more “human” than she was?